Pollyanna. Naive. Just plain dumb. Whatever you call them, happy people bug me. Don’t they know that the world is a terrible place? Don’t they know that they are in for a big let-down. If not now, soon enough? Are they really that naive? Do they really have faith in the ultimate goodness of life? As for what you wrote (Rebbe Nachman of Breslov’s advice )to “force” yourself to be happy, to act silly, to lift your spirits, I’m sorry but happiness is not in our control. If we’re sad we can’t be expected to fake it. That’s disrespectful of our real feelings. I bet God doesn’t expect us to fake it. Let’s face it: Only stupid people are happy. Of course I’m angry. My life is incredibly hard, you don’t know what I am suffering, and you’re so *%@#! joyful it makes me sick. I’m not always joyful. But, I do try. You can’t “try” to be happy, either you are or aren’t. It’s not really something you can control. Speaking from personal experience, I disagree. Happiness has to be worked on, it’s a skill. If we rely on the outside world, events, relationships and so on to make us happy, we’d be happy maybe one or two percent of the time. Oh, come on. What do you know about it? Your life is perfect. (Laughing). My life is not only NOT perfect now, I have such a traumatic personal history that when I share it (which is almost never), most people are shocked. You are talking to me now. You can talk to God, too. No, I mean someone to really talk to. Forget me. You can talk to God. He wants you to talk to Him. He is yearning for you to talk to Him the way you’d talk to a best friend. Right. Everything is so simple for you people who were born into nice religious families. I was not born into a religious family. But yes, you’re right in a way. Belief in God does make things less scary, a bit simpler, unsophisticated. I believe you and I were created for a reason by a God who loves us and wants the best for us. I believe that this reason does not preclude suffering but I also believe that if suffering occurs, it is for a purpose…and, by the way, happy people do suffer, no one is immune from hard times. Suffering is cruel. Either God wants us to suffer and He is cruel or else there is no God. It sounds like you are angry. Don’t I have a right to be angry? What is your anger doing for you? I mean, you feel anger, you are angry. What are you getting out of it? My parents. My ex. My boss. X, my so-called friend. What are you getting out of this anger? Well, you believe all these people have done you wrong and perhaps they have. But what if you choose not to be angry? What if you choose to instead be happy? No “perhaps” about it. I’ve been treated really unfairly. You may not be ready to see the good in these people, and that’s okay. It might take some time to do that. But are you able to shift your focus to yourself? It’s so draining the other way around. What if you decide to use whatever they’ve done to you as an object lesson and choose to never hurt, abandon, condemn, betray, others the way these people may have done to you? Um, I have hurt other people. That’s in the past. But what about the future? Who gets to decide if people deserve your retaliation? You? What if you let judgment remain in the “hands” of God, so to speak, and you just focus on taking care of yourself, building a relationship with God, and not worring about getting back at others? Because so many bad things happen to me. Why is that proof that God isn’t listening? It seems to me that it is just proof that God isn’t doing what you want Him to do. But if He loved me He wouldn’t want me to suffer. God does love you. And He doesn’t want you to suffer. Suffering is often about not getting what we want, whether it is loving parents, money, a great job, a friend, a spouse, kids, or even freedom from pain. Will you consider the possibility that what you want might not be in your best interests, at least your spiritual interests, and that God withholding things from you might actually be helping or protecting you in some way? How could meeting my soul-mate, getting married, and having kids be bad for me? Perhaps your soul-mate isn’t ready yet, maybe he still has a few things to learn about life first? Perhaps you’re not ready yet, and if you met him, you might not recognize him as your soul mate because he doesn’t match up with your present wants and needs? Perhaps if you got married now, you wouldn’t be able to do the work necessary to keep your marriage strong? Okay, maybe you would. But you had a relationship dissolve. That was his fault, he didn’t want to get married. Then, when I broke up with him, he married someone else. Would you consider doing something different if it might yield different results? You told me earlier, in another call, that some of your friends seem to abandon you. You feel like they don’t care about you because they don’t want to listen to your problems. Right, isn’t that what friends are for? No, not exclusively. There are many different types of friends. But there is one friend you can always talk to who won’t get tired of listening. God. He is always there. You don’t have to worry about Him abandoning you. He won’t. Ever. So, you want me to try hisbodedus? But I already have tried it. Several times. Two or three times. For how long each time? I don’t know, a few minutes. It’s hard to concentrate. It can be hard to concentrate. Would you consider trying it again for a period of 30 minutes a day, every day, for one week? I am not sure what I’d have to say to God. Everything you’ve told me. Everything you tell your friends. And more, because you don’t have to impress God, you can just be yourself. And if you can’t talk, just sit there, and say: Hashem, help me talk to you. I need your help. Please help me. In your own words, of course. What if things don’t change? What do you mean by things? What if I do talk to Hashem and I don’t meet a man? What if you don’t? Have you lost anything? Yes. What if talking to Hashem helps you change, helps you feel better about life and yourself? In other words you want me to talk to God so I feel better about how awful my life is? Well, excuse me. But I am x years old, married/never married/divorced/widowed, and have serious problems with my mother/father/husband/child/boss and I’m unemployed/unskilled/trapped in a job I hate and I have money/health/weight problems and I have a lot of loss and pain in my life and I have nobody to talk to. 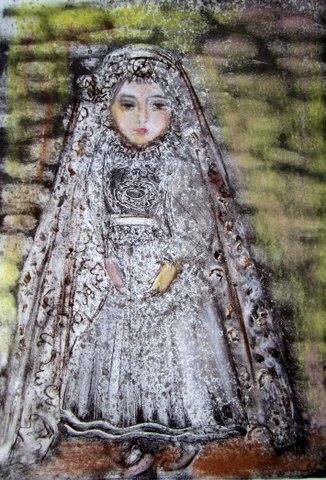 Little Yemenite Girl, Painting by Esther Zibell.